Rachel Owen, a Clinical Nurse Specialist in Cardiac Rehabilitation from Cardiff in Wales has been highly commended for Leadership and Engagement in the British Heart Foundation (BHF) Alliance Awards, at the annual British Cardiovascular Society (BCS) conference in Manchester. 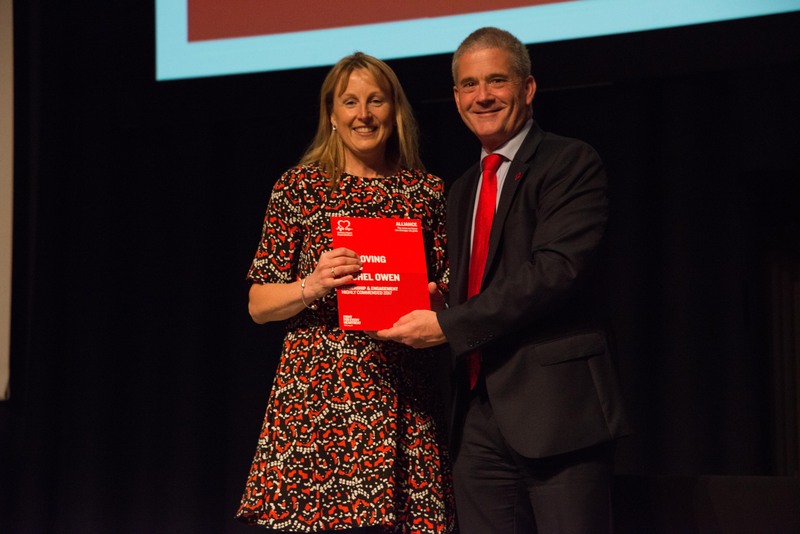 The award, presented by Simon Gillespie, Chief Executive of the BHF which is a key supporter of the conference – recognised Rachel, 50, for demonstrating bravery, compassion and drive in her day to day work. In her role Rachel has shown fantastic leadership by bringing together the national cardiac rehabilitation and heart failure teams to clearly define their work plans and targets for the future across Wales. She is the lead cardiovascular nurse on the Wales Cardiac Network, as well as offering a support network and advice to individual nurses. As well as this, she is instrumental as the lead of the National Audit for Cardiac Rehabilitation (NACR) All Wales Group, working tirelessly to ensure Wales is leading the way in cardiac rehabilitation. There has been an uptake of 59% thanks to Rachel’s commitment, determination and successful management of teams. The BHF Alliance awards are judged in two separate stages by a panel of cardiology and healthcare experts who rate nominations on several categories, including how teams and individuals have gone above and beyond the basic requirements of their role. Rachel has worked for 28 years as a cardiac nurse. She said: “I am incredibly honoured to receive this award. Years as a nurse has meant at times I face extremely difficult and challenging situations but I’m determined to continue the fight to reduce heart disease. Simon Gillespie, Chief Executive of the British Heart Foundation, said: “Rachel’s extraordinary devotion to improving cardiac rehabilitation across Wales shows outstanding leadership.